There are many ways to celebrate Chinese New Year, but exchanging gifts are absolutely the most important part of the celebration. Not only to make the celebration more exciting but exchanging gifts also can strengthen the adored relations and bonds between people, especially with the loved ones. And one of the very best gifts you can give on Chinese New Year is flowers. What can be the more beautiful way to welcome and greet someone a happy new year than flowers? Flowers are the perfect way to build a happy mood, create a smile, and symbolize a fresh start on the new year. New year is always about new beginnings, fresh time, and a time to welcome the future ahead. And flowers surprisingly have that ‘power’ to express the feelings through a single gift. The pale pink flower is a symbol remembrance. 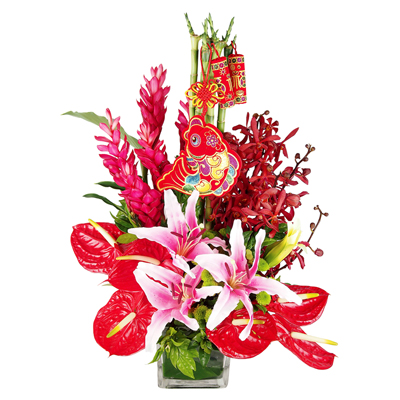 It’s can be your way to tell the receiver of your Chinese New Year flower gift if you will always remember them no matter how far and how long you know them. This flower is a symbol of prosperity. You can use this flower to wish a good future for your receiver on this new year. However, Azalea has a red color that really appropriate for this special occasion. Lily is like a showcase of elegance. This pretty flower is perfect to celebrate the new year as is can brightening up the brand new day in such a beautiful way. They can also be a delightful home decoration to start your year. This is one of the most cheerful flowers that will never fail to bring the joy and positive energy around. They are also can be the personification of “beauty,” and you can use them as a symbol of your beautiful wish upon the new year. Orchid is classy and elegant; this flower will definitely turn your new year into a delightful one. With its exotic and colorful petals, orchids become the sign of happiness in any type of celebration. They are just perfect to be your Chinese New Year flower gift to your special ones. Chrysanthemums are the perfect symbol of ultimate happiness. This flower has an ability to make its surroundings happy and full of joy in a good way. This flower has a natural beauty and a kind of kind message to carry all along. After all, you will never go wrong in giving flowers as your Chinese New Year gift. The flowers are just perfect because they represent good lucks and any good and kind thoughts to the receiver.